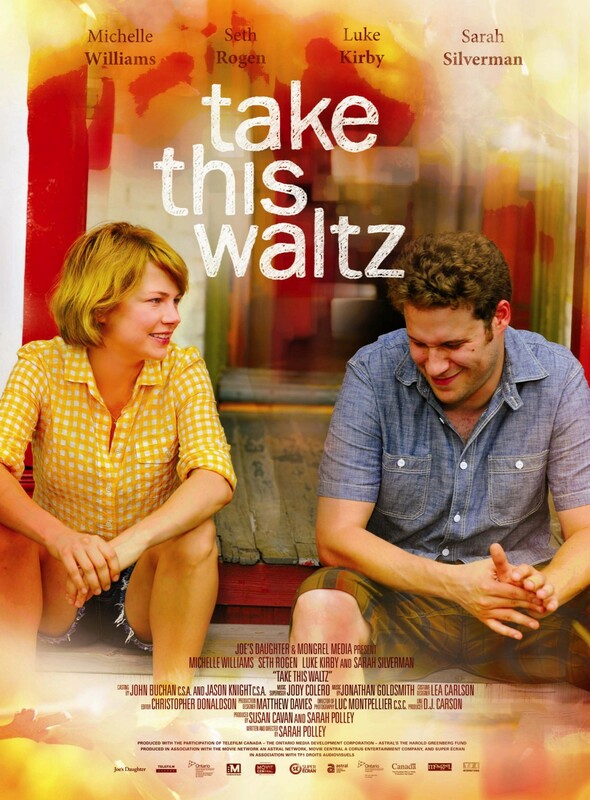 Take This Waltz is a comedy-drama starring Michelle Williams and Seth Rogan, and is directed and written by actress Sarah Polley ( Dawn of the Dead, Mr. Nobody). Michelle plays Margot, a writer and to be honest, a bit of an awkward dork. Whilst married to Lou (Seth Rogan), she takes interest in an artist living across the road, whom she met on a plane coming back from a writing assignment. Margot and Daniel’s (Luke Kirby) relationship blossoms in secret meetings and sexual conversations. It is quite obvious her lust for Daniel, but she feels bad for her husband Lou, who seems to be constantly cooking for her. From there it’s almost like Margot feels sorry for herself, but her lust for Daniel grows stronger. She eventually runs to Daniels house and basically and well, they get it on… something they’ve been wanting to do for weeks. However Margot gets a phone call, and has to rush home to Lou’s where his sister, an alcoholic is getting arrested. Over this, Margot and Lou get talking again, sharing old jokes, and loving looks. But Margot leaves to back to Daniel, crying. I do kind of like the story line, however it is very slow moving, and fairly dorky. Michelle William’s clingy character really frustrates me. She seems to be forever distracting Lou and his cooking by blowing on his face and hanging on to him. However as ever, I loved Seth’s performance, and even Luke’s. They had cool, sweet characters and weren’t irritating. I just find the storyline a bit “done before” and slow. The film had no real ending, and it left me thinking: “Well what happened?”. Margot just went back to Daniel and that was that. No real interesting twist. I did love the cinematography though. It was colourful and kind of pretty in a way. Based in “Little Portugal”, there is colourful houses and interesting deco. A nice difference from pricey apartments in a massive city like New York. I would recommend this film if you’re really into romantic films, but for me it just didn’t excite me or keep me in my chair.